Each arch contains a single figure and the pillars between them don't have bases. The figure in the first arch is an angel with a halo and large wings. He is holding a slender wand. He is facing right. The next figure is sitting on an X-shaped stool facing left, also haloed. These two arches represent the Annunciation, New Testament, Luke 1:26. 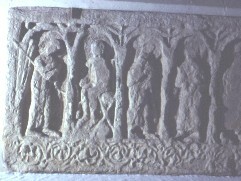 The next two arches (3 and 4) show two nimbed figures facing each other. These are thought to be Mary and Elizabeth in the Visitation, New Testament, Luke 1:42.